Pick a demo site which looks closest to your industry. All demo sites are built using popular ThemeForest WordPress Themes. 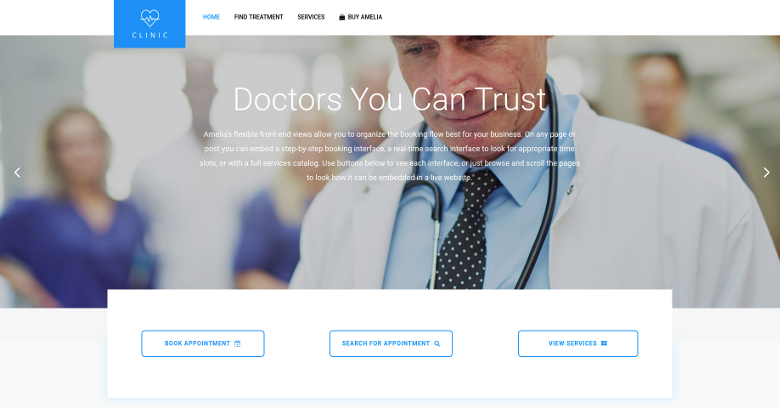 A website of a fake private clinic, where a visitor can read about provided medical procedures and services, and schedule an appointment. 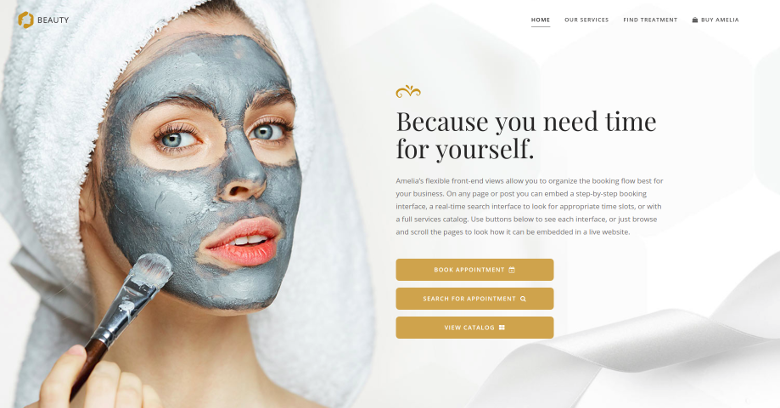 A dummy cosmetology website - look through different cosmetic procedures and treatments, pick an employee and book an appointment. 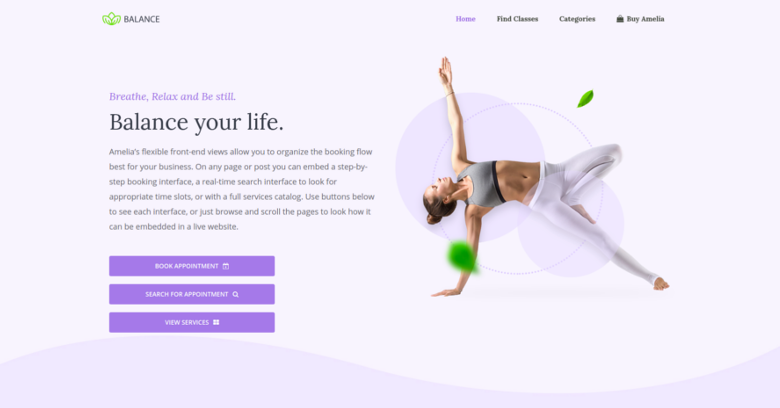 A pseudo Yoga gym website, where one can browse through possible Yoga classes, and schedule individual training. 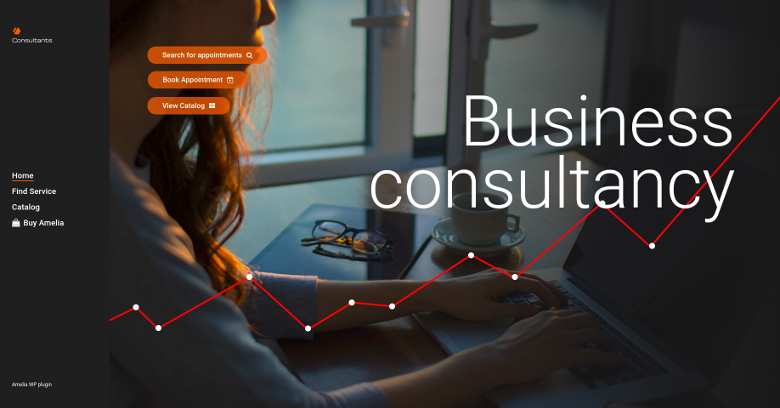 A pseudo Business Consultant / Coach / Lawyer website, where a customer can browse through provided consultancy and lawyer services and book an appointment. Be in instant touch with your customers and employees - communicate with them through SMS text messages. Take advantage of full scheduling flexibility with the custom services schedule feature - configure the working hours and breaks individually per service and employee combinations. With just a few clicks configure non-recurring days with special working hours and service schedule. Construct the booking form to match your business best - configure the custom fields (checkboxes, textareas, etc.) to collect any additional necessary information from your customers. Take care of all your payments, taxes and invoices by using native Amelia WooCommerce integration. Let your employees keep track of all appointments in their own Google Calendar. A convenient search-like interface to look for a suitable service, employee and time by choosing one or more filter criteria. An alternative way of scheduling appointments by choosing one parameter (service, employee, date) at each step. Quickly create an excellent looking services catalog with just several clicks. Keep an eye on how your business performs – track the most important financial and conversion-related KPIs through charts in a dashboard. Amelia provides multiple options for managing the workflow, depending on the level you want to track: monthly, weekly, daily calendar view, timeline, or just an interactive list of appointments. Keep employees contact data in the WordPress database, manage individual load and performance, configure personal working schedule and days off. If you have several business locations, you can efficiently manage this with Amelia, storing contact data, address, and geolocation. Each form that you publish to the site's front-end can be customized: it can allow booking any service or employee, or just a specific one. Appointments do not always have to be individual - Amelia supports group bookings as well (e.g., for group excursions). Each service can have minimum and maximum capacity. Depending on your business, configure the periods for bookings and cancellations. Send e-mail & SMS notifications both to customers and employees - when an appointment is booked, pending, canceled, rejected, birthday greeting, appointment follow-up, and other. Configure the gateway for sending email notifications that suits you best. Enter your standard business hours, non-working days and bank holidays, and each new employee will have this schedule by default, which you can adjust individually later. Currencies and formats are fully customizable. The most popular payment system in the world supported out-of-the-box. Allow your customers to pay for their reservations via Stripe payment system. No matter how many different services do you provide, you can add all of them to Amelia, configuring individual duration, price, and other parameters. Configure buffer time, required before and after the service, if the employees need some preparation before, or clean-up after an appointment. Upload multiple pictures for service, to be shown on site’s front-end as service photo galleries/slideshows. Configure extra services, or special treatments provided additionally with a service, which can optionally raise the service price. If your customers book over the phone, you can quickly add their reservations to the database through the admin panel. While creating a new appointment, you can quickly create a new WordPress user account for the customer, so he could later book with it. List your customers in a convenient filterable grid/list view. Sort by alphabet, or last visit. A single database of all payments where you can check each payment status (finalized or pending), payment gateway (on site, PayPal, Stripe), total amount, discount, and other information. Create and track usage of discount coupons - for all or some specific services, with a particular usage limit, a fixed amount discount or percentage. Choose colors and fonts for the front-end elements to make the booking controls match your WordPress theme and corporate brand style. Amelia has four built-in user roles: admin, manager, employee, and customer. Each role has its scope of permissions. Adjusting user permissions through WordPress’ native capabilities system is possible.